"Customer Worthy by Michael R. Hoffman"
Recommended for chief information officers, chief operating officers, CMOs, marketing directors, brand managers, marketing operations managers, and customer experience managers. Your company’s internal measurements might look fine but customer and contact flow may reflect disengaged and indifferent customers. The result is revenue decline and business erosion. Companies that cannot monitor contact data are continually surprised by revenue shortfall, inventory outages, cost overruns, and diminished customer satisfaction. Traditional financial measures lag too far behind customer activities to be effective for timely decision-making. Customer Worthy shows marketers how to leverage new and future technologies and explains "marketing" to technologists and other management disciplines. Hoffman delves into “customer experience” as the most critical and under-used company asset. He shows how to thread persuasion and innovation through every customer contact across advertising, marketing, sales, operations and customer service. 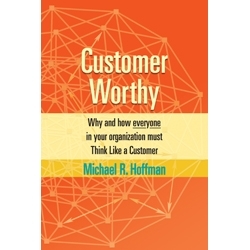 In this groundbreaking book, Michael Hoffman explains how to use what he calls the CxC Matrix to craft each customer experience, contact by contact, to script the best business outcome. The CxC Matrix exposes untapped marketing opportunities resident in every company in every medium. Hoffman delivers a process to visualize, analyze, monetize and optimize every customer opportunity. Hoffman is a software development and management consultant focused exclusively on technology, analytics, and services that deliver businesses optimum yield per customer. Chapter 5: How Complicated Can One Click of the Mouse Be?